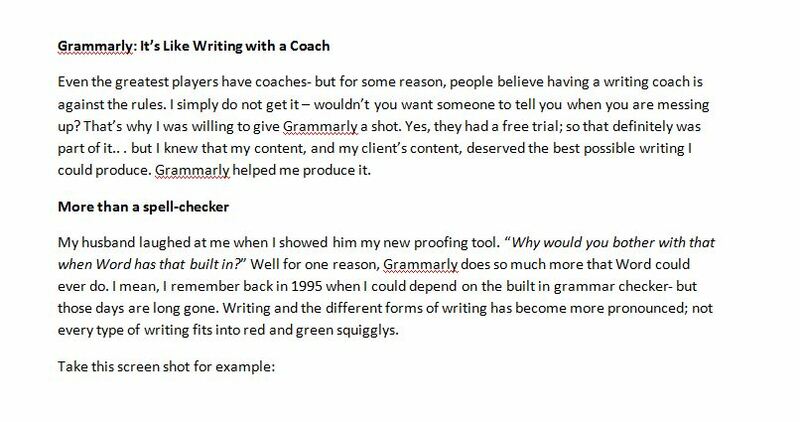 Grammarly: It’s Like Writing with a Coach. Even the greatest players have coaches – but for some reason, people believe having a writing coach is against the rules. I simply do not get it – wouldn’t you want someone to tell you when you are messing up? That’s why I was willing to give Grammarly a shot. Yes, they had a free trial, so that definitely was part of it… But I knew that my content and my client’s content, deserved the best possible writing I could produce. Grammarly helps me produce it. My husband laughed at me when I told him about my new proofing tool. “Why would you bother with that when Word has that built-in?” Well for one reason, Grammarly does so much more that Word could ever do. I mean, I remember back in 1995 when I could depend on the built-in grammar checker- but those days are long gone. Writing and the different forms of writing have become more pronounced; not every type of writing fits into red and green squiggles. Grammarly found 8 mistakes, and 2 possible cases of plagiarism, while MS Word corrected the word Grammarly. All writing is not the same – a good copywriter knows that- but do you? It’s okay, you don’t need to because Grammarly has got you covered. When proofreading your work, simply choose the style of writing you’d like to check it against. Grammarly has six different categories to check against- from medical to casual and everything in between- it knows the rules for MLA, AP, APA and blog style and checks your work against them. No more stiff-sounding blogs or over-casual business letters… just your writing with the right style, punctuation, and grammar. I call Grammarly a coach – and not a cheat – because you must approve or fix every suggested change yourself. Sometimes even, the tool tells you what you’ve done wrong, but doesn’t tell you how to fix it. This happens especially with style issues because they typically require rewording or a different choice of words. If you have a fairly good command of grammar, Grammarly will serve as a powerful safety net that keeps you from making the mistakes you probably don’t normally make. If your writing skills are basic, it can help you learn from your mistakes, making you a stronger writer with each use. With Grammarly, you must approve or deny every suggested change – and most times you are given the corresponding rule the suggestion is based on. It’s like having a dictionary, thesaurus, middle school English teacher, style book and a Google plagiarism search all in one. They may remind you of the rules, but it’s up to you to do the work. Anyone who writes. I can’t begin to express how useful this tool is. It is available as a MS Word plug-in as well as an online tool. It corrects in American English, with the exception of a few Canadian spellings of certain words. It’s free to give it a shot! Test your writing for free and see just how much Grammarly could help you. The free version is limited, but it gives you a good idea about how it works. Don’t worry, if there are too many corrections needed, I’ll be glad to fix it for you. This entry was posted in blog, poetry and writing, short stories and tagged English language, Grammar, writing by jgbaltzly. Bookmark the permalink.